View of El Castillo Pyramid from beside the Platform of the Jaguars and Eagles. Few would argue that one of the greatest sights to see in your lifetime is the Mayan pyramid of Chichen Itza, otherwise known as El Castillo (The Castle) or Piramide de Kukulkan (the Maya Quetzalcoatl). This pyramid has 365 steps for the number of days in the year, 52 panels for the number of years in the Maya sacred cycle, and 18 terraces which symbolize the 18 months of the Maya calendar. 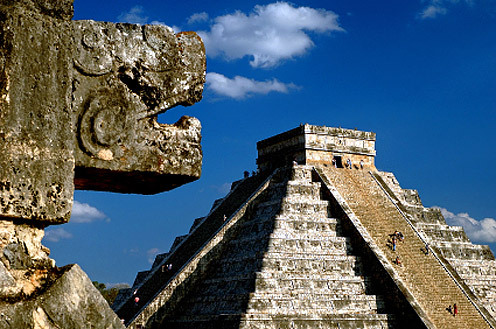 Not only is it one of the greatest surviving monuments of the Mayan civilization and a UNESCO World Heritage Site, but it is the setting for the Spring Equinox that puts most solar eclipses and meteor showers to shame. At the precise time of the spring and autumn equinoxes, the sun casts its rays on the balustrade, in turn highlighting a feathered serpent that seems to be moving or slithering its way down the steps towards the well of sacrifice. The idea that a civilization which evolved as early as 1500BC managed to concentrate its energies in building a monument of incomprehensible scale to highlight the time of year when the hours of daylight and darkness are equal is extraordinary. The archaeology of the site is naturally highly impressive and the ruins are well preserved. It's astonishing how well the structures have stood the test of time compared to other newer civilisations and this is testament to the ability of Mayan construction. Other Mayan achievements include glyphic writing, a calendar achieving better approximation than either the Julian or Gregorian, and the success of plotting many of the planets for a cycle of millions of years.